This dies have a very Europian look to it. That is a marvelous view you share! I love your perspective on this, it is a beautiful view. A terrific shot of the Casa! Interesting contrast in architecture in your photo. Great shot! 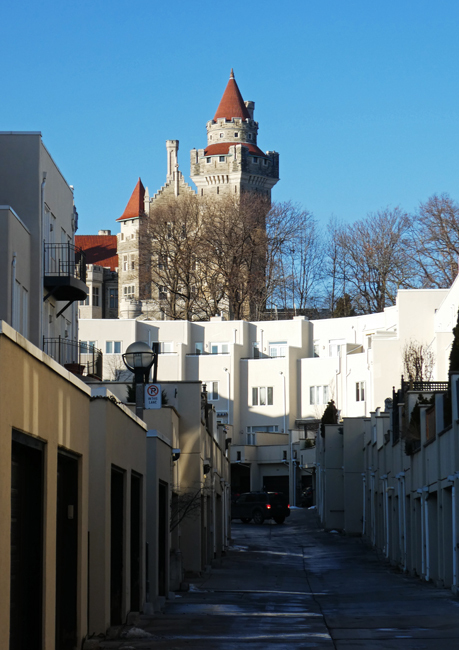 The light on the townhouses and Casa Loma is nice and I love the perspective of the lane. It does look European. The castle makes me think I'm in fairytale land. What can I say... I'm a dreamer. Toronto is pretty far north for me, but it looks like there's a lot of nice weather. Neat viewpoint! Would never have guessed it is in Canada! Beautiful laneway with a great view. Me encanta la torere del fondo.